Do you want to bring continuous delivery to your organization? Or would you simply like to begin your automation Journey? CA Technologies Automation Solutions (formerly Automic) proposes a fourstage blueprint to continuous delivery to assist enterprises at any stage of their DevOps journey. 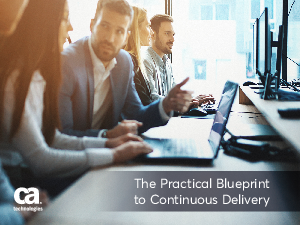 This e-book sets out a plan that can take a company of any maturity level all the way up to enterprise-scale continuous delivery using a combination of CA Continuous Delivery Automation, 40-plus years of business automation experience, and the proven tools and practices the company is already leveraging.